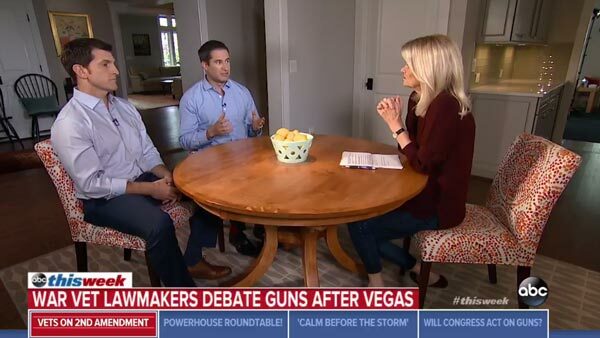 Democratic Rep. Seth Moulton of Massachusetts and Republican Rep. Scott Taylor of Virginia sat down with "This Week" co-anchor Martha Raddatz for a rare bipartisan conversation on how Congress should respond to the mass shooting a week ago in Las Vegas that left 58 people dead. Moulton, who served four tours in Iraq as a Marine Corps infantry officer, said stricter firearms laws can reduce gun violence while adhering to the Constitution. "I've seen the effects of gun violence firsthand in Iraq, and I know that it has no place at our schools, on our streets, at our concerts," the Massachusetts congressman said. "You can have restrictions on guns under the Second Amendment," Moulton said to Taylor. "I mean, a great way to protect your family's home, as you know as a Navy SEAL, would be to have some land mines out in front and have some grenades stockpiled. But we don't allow that in our community ... We don't allow families to own tanks. So we have reasonable restrictions that are perfectly respectful of the Second Amendment, and we know from experience that restrictions like this, that commonsense reforms will help." But Taylor, who served as a Navy SEAL sniper in Iraq, said there is "a very high bar" to taking away people's Second Amendment rights. "When you have a situation that happened, which was tragic, traumatic and everyone feels the same emotion ... it's up to leaders like us to have or to see clarity through the emotional chaos and to understand that it is a high, very high bar to be able to take some folks' rights away, to try to enact policies that take their rights away but not really do anything," the Virginia congressman said. "I'm not willing to impede on people's rights based upon your political desires, I'm just not," Taylor added. The two congressmen agreed, however, that they may be able to find common ground on limitations on bump stocks, a weapons modifier that allows semi-automatic weapons to fire faster.